At Totnes Community Development Society we are all very excited to now be able to invite the whole community to become members of the Society. After the fantastic participation of the community in the Atmos Totnes consultation and referendum, and the wonderful Golden Iris Festival of last autumn, we know things have gone a bit quiet from our side and in particular around Atmos. Whilst we have been quiet about Atmos a lot of work has gone on preparing for the construction phase. There is also plenty of other work taking place on other community buildings in Totnes, including at the Mansion on the high street in Totnes. Part of our focus has been the preparations to fulfil the intention of TCDS to open the membership of the Society to all in the Totnes area, so that everyone can have their say and get involved in helping make sure local projects can develop to fulfil the community wants and needs (for those who were there you will recall this was stated at the public meeting in October 2014). Whether you have been involved in consultations for Atmos Totnes for several years, or came to Golden Iris or have more recently started using the Mansion, thank you for your support to date. So many local people have invested a great deal of time and energy in new ways of facilitating community-led development in Totnes over the past few years. We also know that many people, regardless of political, economic or social background, want locally driven decision making and community ownership of assets to work together, to deliver the things that people in this community most need. 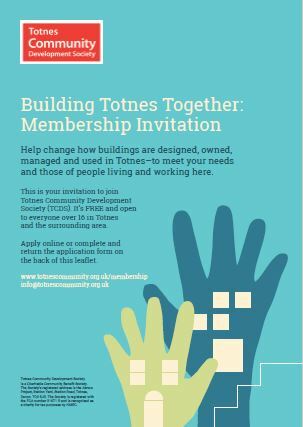 We are pleased to invite you to become a member of the organisation and help deliver more community-led development in Totnes. Membership is open to everyone over 16. Whilst a minimum of 70% of the membership will always be held within the local area, you are welcome to join wherever you live. And don’t worry if you don’t have a fixed residence – you can provide other details to ensure you can participate. If you run an organisation your institution can join too and receive a vote. You will need to nominate a contact as a representative during sign-up. Every member gets one vote. This is regardless of any other role in the organisation they might have (e.g. if they are a Director), or any investment or donation they make or have made to TCDS. Members will be offered a range of ways to get involved, including; attending meetings, voting on resolutions and appointing Directors; being consulted on development plans for TCDS sites and projects; and contributing time and skills to the work of Totnes Community Development Society. Together, the members of TCDS will take the organisation’s work to the next level. We are running open sessions to answer any questions about TCDS membership and about the work of the organisation. Please drop in if you want to find out more, tell us what you think, or just to say hello. Friday 5th October, 10am-12:30pm at the Mansion, Ground floor (Computer Room). And you can email us, info@totnescommunity.org.uk, or leave a message on our answerphone 01803 411787. Totnes Community Development Society (TCDS) has been working since 2012 to bring land and buildings into community use, management and ownership. We are very aware that it is the participation of local people that gets things done. The role of TCDS is to facilitate this participation through democratic collaboration. The consultation to design and obtain planning permission for truly affordable homes, employment and community space at Atmos Totnes, the former Diary Crest site involved thousands of people. The Mansion brings people together every day to obtain essential support or enjoy classes, workshops and meetings. Our first year of partnership with Golden Iris Productions resulted in one of the youngest collaborative festivals in the UK, run by young people within our community, using their skills and creativity together with other local and national professionals. With a broad and active membership we can achieve much more. Please join TCDS online today.